Everyone is talking about Paula Deen having diabetes. The announcement came at a time when many of us are already feeling guilty and trying to cut back after over-indulging during the holidays. Of course, these things are in the back of my mind when I cook. Everyone loves a little splurge now and then -- there's nothing wrong with that. But some of our day-to-day recipes really could be lighter. I can't wait to see interesting new recipes from Paula. So when French toast loving company arrived, I was on the hunt for a recipe that I could prepare in advance. There are tons of them. Paula Deen's five star recipe with 2 cups of half and half and a topping that include half a pound of butter leads the pack on Google. I'm sure it's delicious, but I wanted to do something a little lighter. and there's no heavy cream in it. But would it taste like cardboard? It was great! We didn't miss the oil or heavy cream at all. In fact, while I offered maple syrup and butter, no one even touched the butter. It's super easy to make, and I loved sliding it into the oven to bake while I was still staggering around pre-caffeine. I switched it up a little bit to suit me, but this recipe is a no-brainer. The night before, grease the bottom and sides of the baking dish with just a bit of oil. Whisk together the eggs, milk, cinnamon, nutmeg, and vanilla. Place bread in an oven-safe baking dish. Pour egg mixture over top. Take a minute to turn each slice to be sure they're all covered with the egg mixture. Cover and refrigerate. In the morning, preheat the oven to 450. Uncover the dish and bake for 20-25 minutes. Meanwhile pour the package of Wyman's blueberries into a small pot, add the water and sugar. Bring to a boil and simmer while the toast bakes. 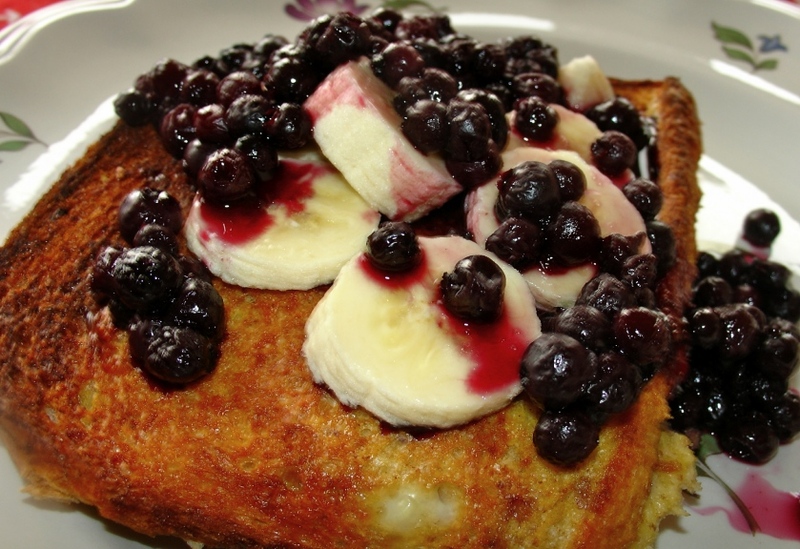 To serve, top each portion with sliced bananas and ladle blueberries and sauce over top. OMG, I want this SO bad right now. I LOVE French Toast. This is a keeper for sure. Thank you for sharing! omg this looks awesome! I am going to try it with egg beaters.... As far as Paula goes... she should get rich on her new drug promotion... waiting three years to come forward is the media hype, she is already being paid back by her illliness money isnt going to fix that in some instances... great read! 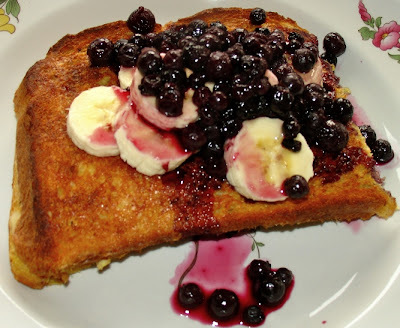 I do have a weakness for French toast, so this does get a big thumbs up from me. Love all the fruit on top as well as the baking method. Delicious. O I love this idea! Sounds delicious and so easy. Great for when you have company spending the night. Very yummy sounding/looking. 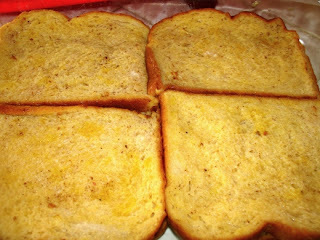 French toast cooked on the stove/griddle tastes too fried-eggy to me now, yuck. I love it baked, though. 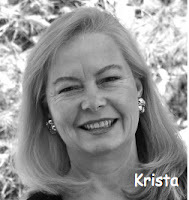 Great post, Krista. Love the recipe and how easy it is and light, too. Perfect for company. I make something similar, gluten-free, with baked apples. So easy! Nice recipe, Krista. I like that you can serve all your guests at once, rather than just a few pieces at a time as they come off the stove. And the lightness, of course. What kind of bread did you use, please? I'm a big fan of baked French toast in principle, but mine never seems to come out right - there is a lot of eggy milk clumped under and around the toast pieces. But those recipes used a lot more milk than you do, so I'm willing to try once more. And by the way, a big Thanks for explaining how you change each recipe to make it healthier for us, in each post. It really helps me understand cooking a lot more! Mmmmmm--sounds delicious. and i love the idea of not having to get up early to prepare something special:). thanks Krista! Hi Shawn! I wish I could send you a serving, but it's all gone! Hi PegasusLegend. Let us know how it works with eggbeaters. Tina, fruit packs such a big punch of flavor. We really didn't miss all the fat. Juju, if you're like me, when you have overnight guests you're the last one to bed and the first one up. It was a true luxury to be able to sleep and not worry about starting breakfast! Christi, I know what you mean. I have been eating very lean beef for years. Now regular beef just feels too fatty when I eat it. Savory Avery! I love it. It should be your slogan! Edith, you're right. It was nice to be able to sit down and eat with everyone instead of being the last to the table. LynnW, I used Pepperidge Farm "Farmhouse Sourdough" bread. It seems to be the trend to use extremely thick slices of bread, but these were normal thickness. By morning, everything had been absorbed. I was curious about the smaller amount of milk, too, but it worked out fine. Lucy, I know exactly what you mean. It was so nice to preheat the oven, start the coffee, and have everything ready in 20 minutes. Extra zzz's for me!